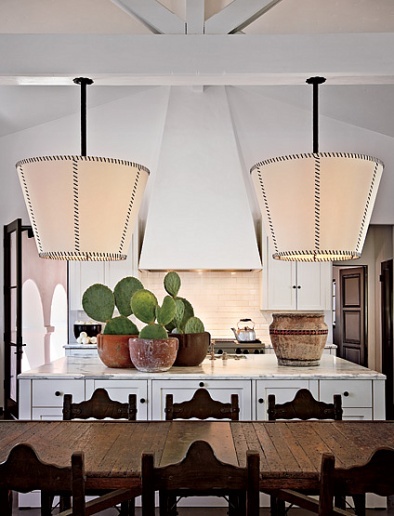 The whip-stitched lampshades, stuccoed range hood and carved, Spanish-colonial side chairs are an indication we've gone west with this kitchen. The cacti, too, are a potent [and prickly] reminder. The upside-down nature of the lighting amuses me; it's the detail that makes the room memorable. Clever! 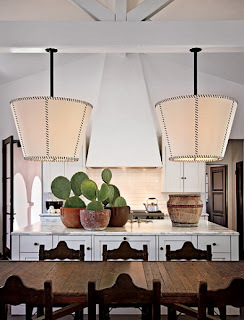 I wonder if those light fixtures are custom - I'd think so right? Given their size, I would think so, too, Jocelyn Hutt. And as the homeowner is actress Diane Keaton, budget would not likely be an issue.